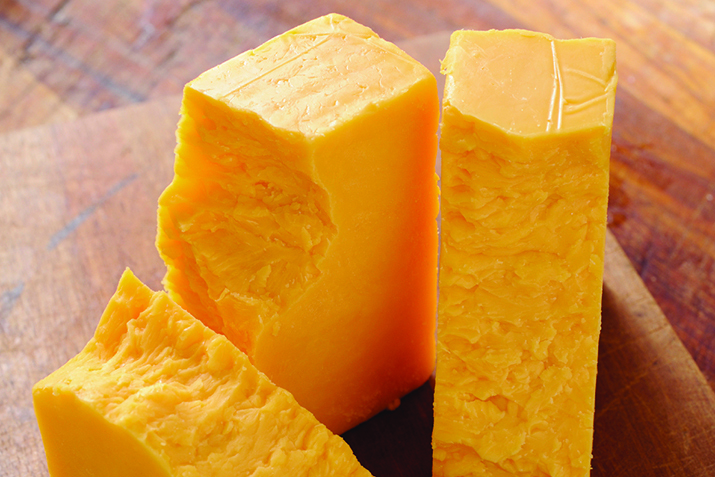 Cheddar cheese is wildly popular—the most widely produced and eaten cheese in the world. And so it makes a great choice for just about any occasion. President Andrew Jackson may have gotten just a wee bit carried away, though, when he served a 1,400-pound block of cheddar at an open house party for 10,000 people (to be fair to the President, the gigantic block was a gift and the reception a smart way to whittle it down). Named for the town of Cheddar in Somerset, England, where it was first made in the 16th century, cheddar is a semi-hard, rich, slightly crumbly cow's milk cheese. The cheese is shaped like a drum, with a rind bound in cloth. Making this particular cheese involves a unique process called “cheddaring,” in which a mat of curds is cut into loose blocks that are turned as they drain. The cheddared curds are cut, salted and put in molds for aging. The name "cheddar" isn't protected as some cheese names are; anybody can make cheddar cheese and label it as such. It's still produced in England, but in the United States, Wisconsin produces the most cheddar, with California close behind. You might also come across a New York (sharp) cheddar, a Colby/longhorn cheddar (which has a mild to medium flavor), and a Vermont cheddar (which designates a white cheddar, not necessarily one made in Vermont). Cheddars can be off-white to pale yellow, or even orange if they've been colored—sometimes with annatto, a natural dye. The flavor of cheddar can be sweet and grassy or sharply assertive, depending on how long it's been aged, and you’re likely to find a perfect cheddar for cheese plates, cheese balls and fondues. It makes a terrific sandwich (especially with hearty whole grain or rye breads), stars on quesadillas and pizzas, and it stands up well in hearty soups, like this Broccoli Cheese Soup, where it blends beautifully with dark beer and mustard. Use it in casseroles and gratins, egg dishes and Mexican dishes. Use it to top salads, baked potatoes and veggies. And, of course, rely on it for macaroni and cheese; here's a Stovetop Mac and Cheese that'll save you some time on a busy weeknight. Pair cheddar with broccoli, cauliflower, onions, peppers, carrots, root vegetables and mushrooms. Its compatibility with broccoli shines in this Broccoli Cheddar Frittata and Broccoli and Cheddar Rice Casserole. For fruit, turn to apples, pears, grapes and dried fruits. In the meat department, cheddar enhances beef, chicken, bacon and ham. Or, if you prefer vegetarian fare, serve it with tofu, tempeh and beans. Seasonings strong enough to highlight cheddar include chives, parsley, cilantro, thyme, garlic, black pepper, oregano and dill. For condiments, rely on zesty choices like mustard, chutneys, horseradish and salsa. Cheddar is also delectable with mildly sweet apple butter. Any beer or hard cider is wonderful with cheddar, too. At home, wrap your cheddar in cheese paper or parchment paper, and place it in the refrigerator, where it'll keep for two months or more. Freezing (for up to six months) will alter the texture, but it'll still be fine for cooking. While you may not need a 1,400-pound block, you probably do want to stock up on cheddar for its everyday palate pleasing versatility.